KAMPALA– Several artistes including Kenya’s Charles Njagua Kanyi aka Jaguar, Member of Parliament for Sitarehe in Nairobi, have called on the government of Uganda to unconditionally release MP Bobi Wine. Kenya’s Jaguar tweeted, “As a brother, fellow artiste, father and family man, I believe his family wants him in the best shape possible, but most importantly to be available, provide, love and stand with them. I await if given a chance to visit my brother, friend and son of our nation,” Jaguar tweeted. 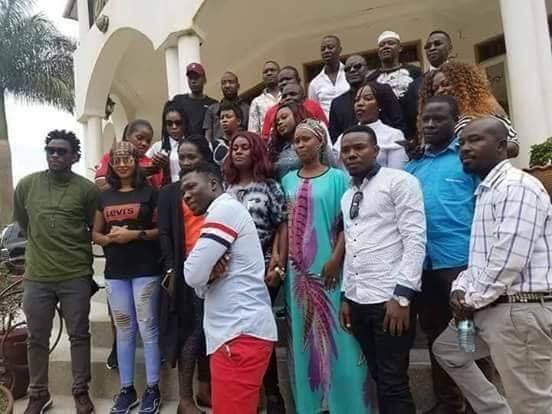 Ugandan artistes Maro, Cindy Sanyu, Winnie Nwagi, Beenie Gunter, Gravity Omutujju, Exodus, Irene Ntale, Kalifah Aganaga, Lillian Mbabazi, Eddy Kenzo and Juliana Kanyomozi among others have come out to condemn the torture and detention of their fellow artiste on different media channels. Sharon O, Kabako, Ray Signature, Chozen Blood, Pallaso, Sheebah, Tipswizy, Aziz, Azion also showed their support on social media. “I’m praying and hoping for the sane ending of all this chaos that’s going on. I call upon all those who are in charge of our brother’s whereabouts to treat him with dignity and respect his rights that he is entitled to as a Ugandan whatever the circumstances he is facing right now. God look upon our country and guide us. We pray for fairness for all in our country,” Juliana Kanyomozi wrote. Bobi Wine, know that we love you and pray that God protects and strengthens you in such a time,” Chameleone wrote in addition to his earlier message asking the President to pardon the Kyadondo East legislator. Sautisol, a Kenyan afro-pop singer and Patoranking a Nigerian reggae-dancehall singer have also shared the hash tag, free Bobi Wine, along with a freedom photo of him. South African music legend, Yvonne Chaka Chaka also tweeted, “I have heard that my Nelson Mandela in Uganda has been brutally arrested, tortured & jailed illegally & due to face an illegal court martial,” she tweeted. Adding, “Dear Ugandans, it’s your right to help this boy. We South Africans have heard a lot of bad things about Uganda but believe with such good hearted people like my friend Bobi Wine everything can change. During our time, we didn’t have the social media but we changed South Africa,” she said Chaka Chaka.